It is just over a year since my farewell gathering at Brookhouse Wood last year. Readers of this blog will know that the winter was spent planning the next phase, while spring was spent erecting a new shelter at Greenwood Cottage. June was a bit wet but after that, running courses in our sunny garden made a pleasant contrast to the leafy woodland canopy. 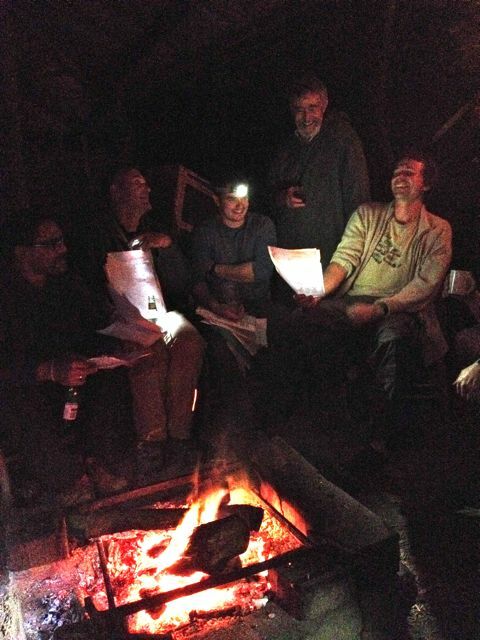 It was only when my old mates, Tom & Owen dropped in for an evening last week, that I realised the one thing I did miss about the woods was the evening campfires with their raucous sing-songs. Having said that, this summer has not been devoid of evening entertainment. 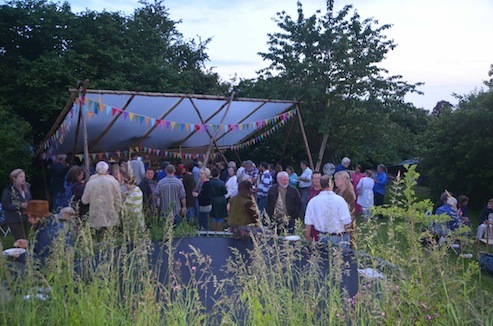 Tamsin’s birthday party in June managed to find itself one of the few dry June evenings with over 100 guests filling our blossoming garden. So before the year is over, we’re planning one final blast, much the same as the two springtime parties we have held over the last few years. After the initial Valentine’s Disco in 2014, we got together with Toby & Aly of Say it with Wood in 2015 to put on The Return of the Sun. With support from other local businesses we managed to raise £333 for the local Green Party and £170 for a charity called Practical Action. This autumn we shall again be collecting for Practical Action, encouraged by the delightful thank-you card from them after the last event. The thank-you card from Practical Action after the last event. The other beneficiary will be a wonderful charity called Peace Direct, having attended an inspiring talk by their founder Scilla Elworthy earlier this summer. We won’t be providing food this year but Alewright will be running a fully licenced bar. The music will again be provided by Stevie Bean and his family, who are keen to try out their new speakers, playing ‘an eclectic mix of soul, rock, disco and more’. Farewell to the Sun will be held in Bishops Frome Village Centre on Saturday 29th October, from 8pm to midnight and tickets will cost just £5 on the door. Just like at the supermarkets, you will be able to choose which charity receives your money, or you can split it between the two, or if you are feeling really generous, you could give them £5 each. We are looking forward to another great evening, getting together with friends old and new, to network, to chat and to dance the night away. We hope to see you there.